We’ve all seen those semi-trucks driving down the highway hauling a trailer full of cars. Often these cars are being moved from one dealership to another. But just like your car is subjected to the weather elements and whatever else may kick up from off the highway, these cars that are transported through open shipping methods are subject to the same conditions. So why don’t more dealerships and individuals in need of transportation use enclosed shipping for vehicles? To be honest, we aren’t sure. Because enclosed shipping benefits anyone who utilizes the service, we think it’s just silly to use anything else. 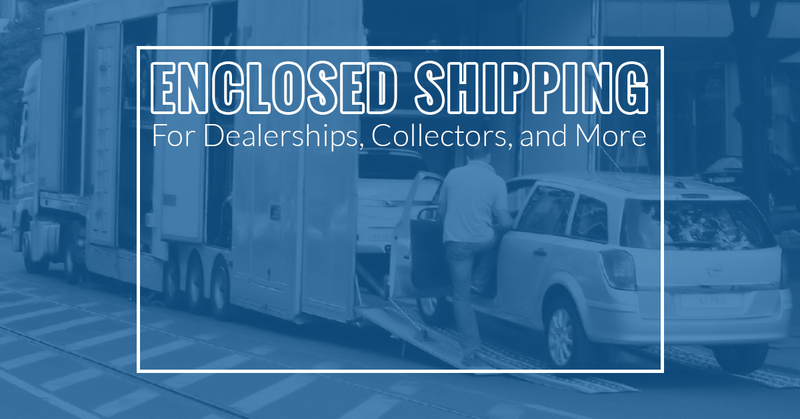 Consider these reasons to ship your car through an enclosed shipping method. Between the ever changing weather conditions and other road hazards that can occur, any car that is shipped through open shipping methods is at risk to paint chipping, dings, and damage to the glass. If there has been snow recently, the odds are gravel and sand have been put down to avoid icy conditions. This will definitely cause damage to cars. Additionally, hail is an ever present threat across much of the United States. No one wants to buy a new car that has damage to the paint or hail dents already in the body. In fact, no dealership should have to deal with vehicles that have been damaged and eat the cost through their business. Instead, invest up front in enclosed shipping to keep cars clean, safe, and dent free. If you own a classic car, you understand the value that comes from keeping it in tip-top condition. Your classic car is your baby and you wouldn’t want it scratched or dented from an open air transport. However, most importantly, you don’t want to chance having your classic car taken. While the chances aren’t high that someone could get a car down off an open air transport, the possibility is still there. Additionally, individuals could easily get to parts and the interior, stealing from your car. But by choosing enclosed shipping with Secure Auto Shipping, you’re choosing to keep your investment safe. Safe from damage and safe from theft. In additional to transporting cars with unique or special needs with enclosed shipping methods from Secure Auto Shipping, anyone can take advantage of these secure and safe methods to ship their own cars. There is no reason to risk your car in open air transport when you can opt for enclosed shipping. In addition to avoiding damage to your car due to a variety of uncontrollable scenarios, utilizing enclosed shipping also provides you with climate control like a garage would in order to protect not just the exterior of your car but also the interior no matter what the temperature is outside the enclosed shipping container. When you ship a car, you want the car to get to its final destination in one piece, damage free. The best, guaranteed way to do this is with enclosed shipping services from Secure Auto Shipping. Contact us today for a free quote to ship your car!